"This image of Jupiter and its moons Io and Ganymede was acquired by amateur astronomer Damian Peach on Sept. 12, 2010, when Jupiter was close to opposition. South is up and the "Great Red Spot" is visible in the image. Ground-based astronomy will play a vital role in the success of NASA's Juno mission. 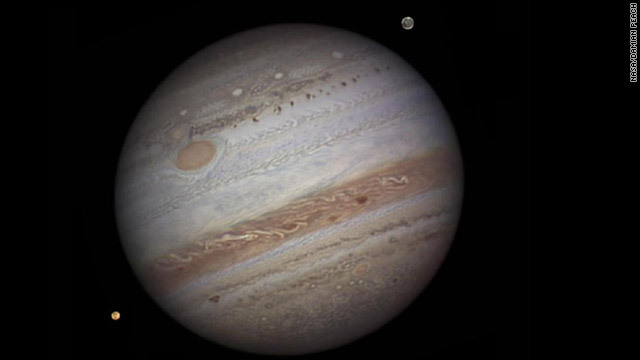 Because Jupiter has such a dynamic atmosphere, images from amateur astronomers will assist the JunoCam instrument team predict what features will be visible when the camera's images are taken. With its suite of science instruments, the Juno spacecraft will investigate the existence of a solid planetary core, map the planet's intense magnetic field, measure the amount of water and ammonia in the deep atmosphere and observe the planet's auroras."